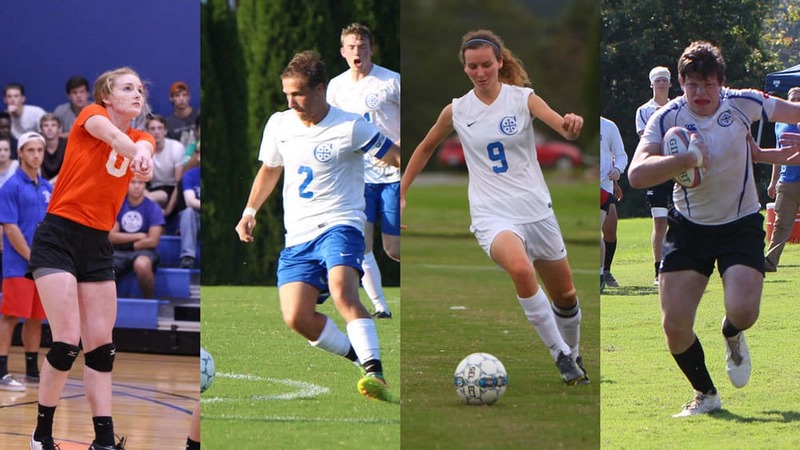 Christendom’s fall sports teams entered 2018 with good expectations for their seasons, but it is safe to say that each team has taken significant steps — even leaps — past those goals. With the end of the fall season nearing, the teams have secured high national rankings and fielded top scorers, with key games left to be played. Of the fall sports, the Lady Crusaders volleyball team is on the biggest roll of them all, riding a 13-game winning streak all the way to the #2 USCAA ranking in the nation — the best ranking ever in the history of the volleyball program. Most recently during that stretch, the Lady Crusaders have not even lost a set in four straight matches, shutting out Washington Adventist, Davis College, the Culinary Institute of America, and, in their last game before fall break, Trinity University. The Lady Crusaders have six games left in their regular season, next playing against Cedar Crest and the University of Notre Dame of Maryland this Saturday. On the men’s soccer field, the Crusaders are taking aim at one of their best seasons ever, with several seniors looking to leave their mark on school history in the process. The Crusaders currently sit at the #5 ranking in the nation, with a 7-2 record. On top of that, Pete Day is on pace to become one of the highest scorers ever at Christendom. With 21 goals on the season and 46 points overall, Day is 2nd in both categories in the USCAA while junior Michael Urankar is tied for the national lead in assists. The Crusaders will enter the final stretch of their regular season on Friday at Central Penn. The Crusaders rugby team survived an opening stretch against four D-II teams to now sit at #6 in the NSCRO, ranking above Duke, Vanderbilt, and the College of William and Mary, among others. With one game left in their fall season, the Crusaders are looking primed for another run at the national championship. The Lady Crusaders soccer team currently ranks #14 in the USCAA as it enters its final weeks of regular season competition. As a team, they are competing hard through a tough stretch, with several players putting up remarkable individual performances to keep the Lady Crusaders in the hunt. Senior Gemma Youngman is leading the way, not just at Christendom but in the whole country, scoring 19 goals so far while also coming in second in the USCAA in points scored with 44. Right behind her is freshman Annie McGraw, currently tied for the lead in the country in assists with 11 and placing 5th overall in points scored with 39. On the running trails, the burgeoning Crusaders cross-country teams continue to make a strong impression, both at the school and in the USCAA. Now in its third year, the men’s and women’s teams are making strong showings at multiple meets, even taking third and earning the sport’s first trophies at the Westmoreland Invitational. For more information, visit christendomathletics.com.